Լուի Արմսթրոնգի տուն-թանգարանի ինտերնետային կայքը նշում է.
Իր երկար կարիերայի ընթացքում նա նվագել է այդ ժամանակների ամենահայտնի գործիքներով և երգել ամենահայտնի երաժիշտների հետ, որոնց շարքում էին Բինգ Քրոսբին,Դյուկ Էլլինգթոնը, Ֆլետչեր Հենդերսոնը, Էրլ Հայնսը, Ջիմմի Ռոջերսը, Բեսսի Սմիթը և միգուցե ամենահայտնին՝ Էլլա Ֆիջերալդը: Նրա ազդեցությունը Քրոսբիի վրա հատկապես կարևոր դեր խաղաց զանգվածային երաժշտության հետագա զարգացման համար. Քրոսբին հիանում ու նմանակում էր Արմսթրոնգին, որի վառ ապացույցն էր իր վաղ ձայնագրությունը՝ 1931 թվականին ձայնագած «Just One More Chance»-ը: Ջազի Նոր Պուրակ բառարանը մանրամասն նկարագրում էր Քրոսբիի պարտքն Արմսթրոնգի նկարմամբ, թեպետ Արմսթրոնգի անունն այնտեղ չի նշվում. ↑ 1,00 1,01 1,02 1,03 1,04 1,05 1,06 1,07 1,08 1,09 1,10 German National Library, Berlin State Library, Bavarian State Library et al. Record #118504053 // Gemeinsame Normdatei — 2012—2016. ↑ Bergreen (1997), p. 1. ↑ «When Is Louis Armstrong's Birthday?»։ Արխիվացված օրիգինալից-ից January 16, 2013-ին |df= պարամետրը գոյություն չունի (օգնություն) The Official Site of the Louis Armstrong House & Archives. ↑ Teachout (2009), pp. 26Կաղապար:Endash27. ↑ Bergreen (1996), pp. 14–15. ↑ 17,0 17,1 Giddins (2001), pp. 22Կաղապար:Endash23. ↑ 20,0 20,1 Bergreen (1997), pp. 27, 57–60. ↑ Some sources spell Karnofsky with one "f". This article is spelling it with two "f"s based on Bergreen (1998). ↑ Bergreen (1997), pp. 55Կաղապար:Endash57. ↑ Giddins (2001), pp. 36–37. ↑ Bergreen (1997), p. 6. ↑ Bergreen (1997), pp. 67–68. ↑ Bergreen (1997), pp. 70–72. ↑ Current Biography 1944. p. 16. ↑ Bergreen (1997), p. 78. ↑ Bergreen (1997), pp. 80–84. ↑ Bergreen (1997), pp. 85–89. ↑ Kenney (2005), pp. 57–59. ↑ Bergreen (1997), p. 142. ↑ Bergreen (1997), p. 170. ↑ Bergreen (1997), p. 199. ↑ Bergreen (1997), p. 260. ↑ Bergreen (1997), p. 274. ↑ Bergreen (1997), p. 264. ↑ Bergreen (1997), p. 267. ↑ Bergreen (1997), p. 320. ↑ Bergreen (1997), p. 344. ↑ 71,0 71,1 Bergreen (1997), 134–37. ↑ 79,00 79,01 79,02 79,03 79,04 79,05 79,06 79,07 79,08 79,09 79,10 79,11 79,12 79,13 79,14 79,15 79,16 79,17 79,18 Bergreen (1997), pp. 7–11. 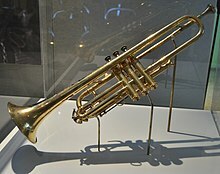 ↑ "Louis Armstrong: An American Genius", James L. Collier, 231 pp. 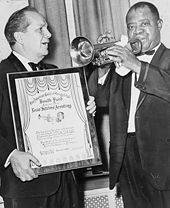 ↑ «Louis Armstrong, Barring Soviet Tour, Denounces Eisenhower and Gov. Faubus»։ New York Times։ September 19, 1957։ Վերցված է August 30, 2007 See also, from September 23, 2007 David Margolick, The Day Louis Armstrong Made Noise. ↑ Bergreen (1997), p. 472. ↑ Teachout, Terry (2009) Pops: A Life of Louis Armstrong pp. 293–94. ↑ Armstrong, Louis. Christmas Through the Years, Laserlight 12744. ↑ Jive Dictionary, by Cab Calloway: "Barbecue (n.) – the girl friend, a beauty." Retrieved February 10, 2009. ↑ Bergreen (1997), p. 4. 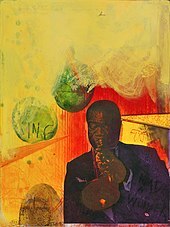 ↑ Michael Cogswell, Louis Armstrong: The Offstage Story of Satchmo (Collector's Press, Portland, Oregon, 2003) 1-888054-81-6 pp. 66–68. ↑ "Hit Parade Italia" Hit Parade Italia – Festival di Sanremo 1968. ↑ "Mi va di cantare" Lara Saint Paul – lavocedelledonne.it Archived January 25, 2009, at the Wayback Machine. 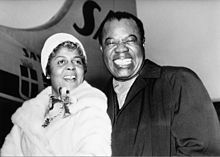 ↑ Louis Armstrong: "Grassa e bella" Louis Armstrong Discography Archived January 11, 2014, at the Wayback Machine. ↑ Krebs, Albin. 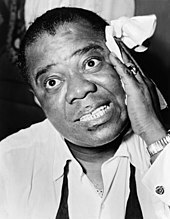 "Louis Armstrong, Jazz Trumpeter and Singer, Dies", The New York Times, July 7, 1971. Accessed October 1, 2009. 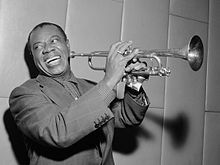 "Louis Armstrong, the celebrated jazz trumpeter and singer, died in his sleep yesterday morning at his home in the Corona section of Queens." 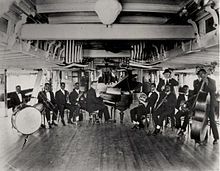 ↑ See Ken Burns' Jazz CD Set liner notes. ↑ Bergreen (1997), p. 11.